You’ve spent a lot of time and thought designing your garments, and now you need the finishing touch. It’s important to select quality woven labels for your brand, as branding goes an awfully long way in influencing how your customer feels about your products. There are a few things to consider when deciding how to design woven labels, and they are weave, colour, size and your company’s logo. First of all, select the weave that is right for your garments. Taffeta (or ‘plain weave’) is the most popular for bulk items such as t-shirts, or low-end items. Taffeta is good for highlighting small details, and works best with a dark background. Next up is Satin weave, which is more commonly used for evening wear or other high-quality garments, as the label will have a sheen on it. Satin labels may only have a white or black background, but your logo can be any colour you like. Finally, Damask weave creates a versatile and high-quality label that is used widely throughout the fashion industry for mid- to high-priced garments. You can use any colours you like and your logo will have excellent definition. In terms of colour, most companies will use between one and three colours for their woven labels, but some manufacturers are happy to accommodate up to eight colours, although beware that this may be reflected in the price that you end up paying. It will help to work out whether you would like a logo on your labels or whether you would simply prefer the name of your company (the latter may be a more budget friendly option) as this will influence the final number of colours on your label. 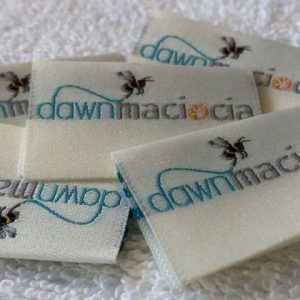 Lastly, approach a manufacturer who is able to be flexible and advise you when it comes to the width, length, colour, text and overall design of your woven labels. After all, they are professionals and know what it takes to create a great label that distinguishes you from your competitors.